Tonight, 22 Shvat is the 149th yahrzeit of the "Seraph" [fiery Angel], Rebbe Menachem Mendel of Kotzk, [1787-1859], popularly known as the Kotzker Rebbe. We previously blogged on him here. Rebbe Menachem Mendel received a thorough Torah education from his father, R. Leibush Morgenstern, a zealous opponent of Chassidus. When he was 13 years old he had mastered the entire Talmud. After his marriage at 14, he was introduced to the world of Chassidus, and before long he became an ardent follower of the Chozeh (Seer) of Lublin and Rebbe Simcha Bunim of Pshischa, whom he eventually succeeded. When he became the Rebbe of Kotzk, thousands of Chassidim flocked to that city, and a great number of outstanding young Torah scholars were attracted by his saintly personality and wide range of knowledge. Most prominent among his students were the Chiddushei HaRim of Ger and Rebbe Chanoch Henach of Alexander. Although he did not write a sefer, his thoughts and commentaries were collected and published in Ohel Torah and Emet V'Emuna. He was an awe-inspiring figure who left an indelible mark on Chassidic thought. 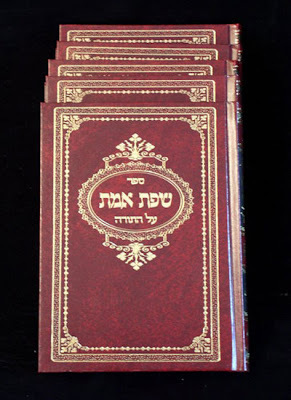 The Kotzker Rebbe's wisdom was also recorded in the book Amud HaEmet (Hebrew). "Three ways are open to a man who is in sorrow. He who stands on a normal rung weeps, he who stands higher is silent, but he who stands on the topmost rung converts his sorrow into song." This reminds me of a story Reb Shlomo Carlebach tells about one of his niggunim, Motzi Asirim. "I took my guitar out again. I opened a prayer book and there it said, 'Motzi asirim…G-d opens all the prisons.' There’s Some One up there Who redeems all the humble. Because is there anybody more humble than the Russian Jews? They’re the holy of the holiest and they don’t even know about it...He helps all the poor, the Yiddilach in Russia…they’re so holy, they’re so poor and they’re so sweet. They’re on their way to Yerushalayim. G-d promised us you’ll listen to our prayers. Just one time, G-d, listen to us this time. Don’t let them die. I can’t wait to see all of them in Yerushalayim by the Holy Wall." While searching around the Blogosphere, I found this link to, apparently, a Kotzker niggun. Can anyone verify this? Zechuso yagein Aleinu – May the Kotzker’s merits protect us all!!! Tonight and Thursday, 17 Shvat, is the 152nd yahrzeit of Rebbe Yechezkel of Kuzmir, one of the leading talmidim of the Chozeh of Lublin, and the Avi HaShosheles [founder] of the Modzitz Chassidic dynasty. The first Modzitzer Rebbe, the Divrei Yisrael, was his grandson. You can find out more about him here, in our previous post: Rebbe Yechezkel of Kuzmir, founder of the Modzitz Dynasty. The following story is reprinted here with permission of the Modzitz website. One Friday night in Kuzmir, a man arrived at Rebbe Yechezkel's Tish whom none of the hundreds of Chassidim that were present recognized. For the duration of the entire Tish, this man stood opposite the Rebbe and stared directly at him. The Rebbe continued in his usual way with Shabbos zemiros. At the end of the Tish, the Rebbe wished his guests "Good Shabbos," and went off to his room. The strange man left as well. No one asked about his unusual behavior; in fact, no one spoke to him. This strange behavior repeated itself at the Tish on Shabbos morning, with the man again standing opposite the Kuzmirer and staring at him for the entire time. And at Shalosh Seudos [the third meal, held close to sunset], again this man came and stared at the Rebbe. At nightfall, the custom was to have candles brought to the table [either by a non-Jewish attendant, or by one of the Chassidim who was prepared in advance to daven Ma'ariv immediately at nightfall, and then is permitted to light a fire]. This unusual guest then positioned himself where he could see the Rebbe's face directly from the light of the candles, and stared at him once again. The Rebbe then said divrei Torah, accompanied by cries of dveykus [clinging or attaching oneself to Hashem]. His lofty words, said in a very sweet and pleasant voice, caused everyone present to forget his own problems and to be davuk in [attached to] Hashem. But suddenly, the Rebbe's voice rang out: "Why are you staring at me so much? Don't you recognize me?" Immediately thereafter, the Rebbe asked for mayim achronim ["final waters" used to wash one's hands at the end of a meal] to be brought, bentched [said the Grace after Meals], davened Ma'ariv and made Havdala. There was one Chassid present who was really curious about what the Rebbe intended with his words to this strange man that nobody knew. Surely there was "more than meets the eye" going on here. He was so intent in finding out that he followed this man out of the Beis Medrash after Havdala, and when they reached an isolated spot, a dark alley way, he asked him what this encounter with the Rebbe was all about. "Oh, this is an old story," replied the man, trying to avoid a full answer. But the Chassid wasn't satisfied with this, and insisted on hearing all the details. "In that case," replied the man, "you'll have to come with me to my place of lodging, and I'll tell you the whole story." Over a cup of tea, the man began: "I left Olam HaZeh [this world] for the Olam HaEmes [the World of Truth, where the neshama (soul) goes after death] some twenty-two years ago." The Chassid began to tremble, seized with a terrible fright - could it be that he's speaking to some kind of spirit or ghost? Reassuring him, the man said, "Allow me to speak, and then you'll understand everything." "Twenty-two years ago, I was a melamed [a teacher of young children]. Even though my livelihood only allowed us to have some black coffee and dry black bread, but no meat, fish or fancy clothes, my wife, our two children and I were happy with our lot and never complained. We accepted our lot in life with love. "Around that time, I contracted a severe case of pneumonia. The doctors attempted to treat it with medicine, but I could tell by the look on their faces that they didn't hold out too much hope for me - my days on earth were limited. Nevertheless, they informed my family that I was improving and that I would be able to return home in a few days. You can just imagine what it's like for a young man of twenty-two years to leave this world and leave behind a young widow and two small children! The man continued, "You know, when a person departs from Olam HaZeh, he still thinks he's alive. So it was with me - I merely thought that I didn't have the strength to get up. I thought my family didn't want to hear what I wanted to say to them. They invited the Chevra Kadisha [Jewish burial society] to begin their holy work on me [preparing the body for burial]. My wife and children were crying. It was then that I realized that I had left this world, and I thought: what a tragedy, a young man leaves behind young orphans - who's going to care for their welfare, that they should receive a proper Torah chinuch [education] and in such a society - where they kidnap people, etc.? Who is going to care for my little children???
" 'You are in the World of Souls [Olam HaNeshamos],' the man answered. Pointing off into the distance, he said, 'Over there, the Heavenly Tribunal [Beis Din shel Ma'alah] sits, and judges who is fit to be cleansed from Olam HaZeh, and who is fit to enter Olam Haba [the heavenly world]. I will tell you something that can be very helpful to you. You should go to that distant place where the judges are. Among them is one of the Tzaddikei HaDor [most righteous in his generation], a man of Olam HaZeh. He was chosen to be on the tribunal because he is so righteous; in fact, he is the only one from Olam HaZeh - with a body and soul - that is on the tribunal. Since he is still involved with Olam HaZeh, he can find merits for your case, and fully understand it.' Upon finishing his advice, the soul of this man vanished. "Back at my funeral, the Chevra Kadisha, my family and all those who attended were astonished to see me sit up suddenly, and in their extreme fear, they all fled from the cemetery. I was left alone in the cemetery with hundreds of graves, but I remembered everything that had happened. At nightfall, I got up and walked home. Of course, there was a great tumult throughout Galicia about this awesome techias haMeisim [revival of the dead], but over time, things quieted down and it was forgotten. "But I never forgot! I always wanted to know who this tzaddik from Olam HaZeh was, who was part of the Heavenly Tribunal, and in whose merit I was granted more years of life. I wanted to see his face and thank him personally. I began to travel throughout Galicia and Hungary in search of the tzaddik, whose image was always before my eyes. But I didn't find him! I gave up my search and returned home, but whenever someone from out of town came to our town, I told him my story and described the tzaddik, perhaps someone would know where I could find him. "Over the course of time, I began to forget exactly what the tzaddik looked like. When I reached my forty-fourth birthday, I realized that the additional time allotted to me by the Beis Din was soon to expire. It upset me very much that I still hadn't found him in order to thank him. So I began again to inquire in all the shuls and Batei Midrashos [study halls], until I found a Polish Jew who had come to my town. I told him the story, and he asked for a description of the tzaddik. I remembered that his most distinguishing feature was that he was extremely tall; in fact, he was a 'head taller' than the other judges. 'It must be Rebbe Yechezkel of Kuzmir, who is indeed very tall,' he told me. 'In fact, when he needed a new hat, they needed to make a special order for it; and also for his walking stick.' [This walking stick has been passed down from father to son in the Kuzmir-Zvolin-Modzitz dynasty, and is indeed very large - much more than normal height]. "I left everything and went to Kuzmir, Poland. At the Tish on Friday night, I couldn't remember if the Rebbe's face was the same as the judge who was on that Heavenly Tribunal. However, his pleasant voice was somewhat familiar. Similarly at the second meal, I still wasn't sure if this tzaddik was the judge who had helped me. But at Shalosh Seudos, when I heard his awesome divrei Torah, I remembered clearly that this was exactly how his voice sounded when he was discussing my case in the Heavenly Court. "It was at that very moment, when I was certain that he was the Tzaddik HaDor who told me that I could live for another twenty-two years, that he finished his divrei Torah, and said to me: 'Why are you staring at me so much? Don't you recognize me?' "
Zechuso yagein aleinu v'al kol Yisrael – May Rebbe Yechezkel’s merits protect us all! This Shabbos, Heh [the 5th of] Shvat, is the Yahrzeit of HaRav HaKadosh Rebbe Yehuda Aryeh Leib Alter, better known as the Sfas Emes, the second Gerer Rebbe. [We previously wrote about him here]. He was the son of R. Avraham Mordechai zt"l, who was the eldest son of the Chiddushei HaRim [the first Rebbe] of Ger. He was born on Erev Rosh Chodesh Iyar 5607 (1847), and as a boy of only two, he was orphaned of his mother. When he was about nine years old, his father was also niftar [passed away], and he was brought up by his holy grandfather who treated him as a son, even rebuking him when necessary. Once when the young boy came late to shiur [a Torah lesson], the Chiddushei HaRim rebuked him publicly, which he accepted in silence. His friends, who knew that he had been up all night learning, asked him why he did not tell his grandfather so. "It wouldn't have been worth forfeiting my grandfather's rebuke," replied the boy. After his bar mitzva, he married the granddaughter of R. Baruch Tam, and continued living in Ger with the Chiddushei HaRim. Upon the petira [passing] of the Chiddushei HaRim in Adar 5626 , most of his Chassidim crowned Rebbe Chanoch Henach of Alexander as their Rebbe. A minority went over to Rebbe Avraham of Chekhnov. At the tender age of 18, the young R. Yehuda Leib was appointed Av Beis Din of Ger, in place of his grandfather. Some of his grandfather’s Chassidim, including some of the prominent elder ones, wanted to crown him as their Rebbe, but he wouldn’t hear of it. In addition, his grandmother, the widowed Rebbetzin, could not bear the thought of anyone taking the seat of her late husband as the Rebbe. The Sfas Emes wavered for several months, until he finally opted to join the Chassidim of Alexander. Four years later, Rebbe Chanoch Henach was on his deathbed, and he sent a letter to young R. Yehuda Leib, summoning him to come. Along with thousands of others, the Sfas Emes came to Alexander. On his last Shabbos, the Rebbe remained in his room near the beis medrash, bedridden. Rebbe Avraham of Porisov told the following: "The Alexander Rebbe instructed how to give out the aliyos to the Torah. I knew that the one who would receive Shishi, the sixth aliya, would be designated as his successor. I had good reason to believe that I would be chosen. When they came to Shishi, I fastened my gartel, and accepted the mastery of the Gerer Rebbe." On 18 Adar 5630, Rebbe Chanoch Henach of Alexander passed away. Young Rebbe Yehuda Aryeh Leib returned to Ger, followed by thousands of Chassidim. No one asked him if he accepted this position or not, there was no hesitatation. The entire congregation of Alexander Chassidim accepted the mastery of the young Rebbe by an overwhelming majority. Only a few went over to Rebbe Avraham of Sochatchov, the Avnei Nezer. But the young Sfas Emes did not accept this so readily. R. Tzvi Hersh, one of the elder, prominent Chassidim who had been the right-hand man of the Kotzker Rebbe [the Rebbe before the Chiddushei HaRim], came to the new Rebbe. The Sfas Emes asked him why didn’t he become the Rebbe? "What do you want from the Chassidim? They should crown a Rebbe with a sefer Tehillim [Book of Psalms] in their hand, praying that he should live?" was the reply. When the Piltzer Rav, R. Pinchas Eliyahu came in, the Sfas Emes complained, "Both my grandfather and the Alexander Rebbe were left to their latter years till they became Rebbes. I’m just starting out [my life], and I’m already closed in from all sides?" The Piltzer Rav answered, "Even a Rebbe has to accept the Divine decree, and the 'suffering' of a Rebbe with love." The Chassidim would not relent, and on Shavuos a huge throng arrived in Ger. The young Rebbe came into the Beis Medrash, filled from wall to wall with Chassidim, and said, "If I can’t keep you from coming, then we should strengthen each other, in friendship." But when he saw Rebbe Avraham of Porisov, he told him, "If you’re here, I’ll learn a bit from you, and you from me." Upon the death of his grandfather, the Chiddushei HaRim, Rebbe Yehuda Leib was very careful not to sit in his seat, as mentioned above. 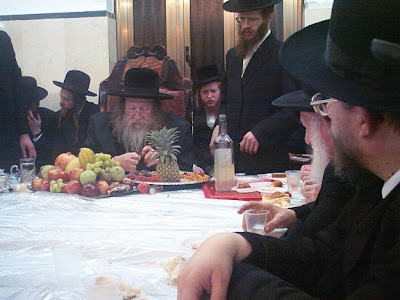 This continued even after he became the Rebbe in Ger - he would sit in the middle of the table with the Chassidim. In fact, his successors - the Imrei Emes and the Beis Yisrael - continued this practice. In addition, he refused to wear the special garments of the Rebbe – special hats [one for weekday and one for Shabbos] and a white silk bekeshe [long Chassidic coat] for Shabbos. The latter his grandfather had given him, but he only wore it to his chasuna [wedding]. Once more, the Porisover came to him and said, "If you are small in your own eyes, yet you are the head of the Jewish People. The Chassidim want their Rebbe to wear the special clothes, for the honor of this great house, his grandfather, our Rebbe, and his predecessors…"
Although he conducted a Tish that Shavuos, he still did not say divrei Torah in public until Sukkos of the following year. Finally, when he started giving forth his pearls of Torah wisdom, the world was astounded. These divrei Torah were printed in his famous sefer, Sfas Emes al HaTorah. His sefarim on Shas were also printed many times. 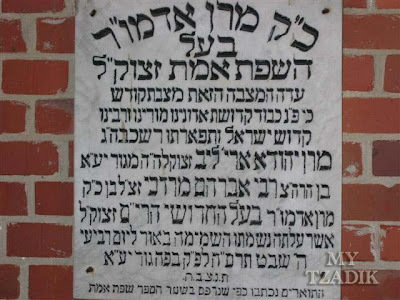 Some time later, after the original beis medrash had burnt down and a new one was built in its place, the Sfas Emes asked one of the Chassidim to make a sign, stating the purposes of the beis medrash. The Chassid had a sign printed: "This Beis Medrash is for Torah, Tefilla [prayer] and Chassidus." When the Sfas Emes saw this, he instructed him to remove the word "Chassidus" from the sign. He explained: "Someone is liable to come here and chat. If anyone criticizes him for this, he’ll say that he was speaking matters of Chassidus…"
One of the central items in the Gerer tradition is known as 'the Kotzker Kvittel', which was sent by an elderly Chassid, R. Yaakov Yitzchak of Wolotchlabek. R. Yaakov Yitzchak was a Chassid of Kotzk, of the Chiddushei HaRim, of Rebbe Chanoch Henach of Alexander, of the Sfas Emes, and of the Imrei Emes. In the year 5665 (1905), after the Sfas Emes had passed away, the elderly Chassid went in to see the new Rebbe, the Imrei Emes, handing him a long kvittel [note] packed with memories of the time he spent in the presence of various Rebbes.
" . . . What can I possibly say? I went to Ger over one hundred times over the course of 35 years. I heard much Torah from him. Most of what I understood I understood with ease and what I did not understand, not only did I not fully comprehend what he meant, but I did not even begin to comprehend what he meant, for all who had eyes to see and a heart to understand realized the Shechina [Divine Presence] was speaking through the throat of this tzaddik. His words were very deep; innermost secrets hidden away and anyone who claims to be able to grasp his holy words - with the exception of a few select individuals - is mistaken.
" . . . Everything I was able to grasp on my first journey to visit his father, Maran Hakodesh [the Sfas Emes] z"l - on my second journey I realized on the first journey I had grasped nothing, and the same on the third journey, etc., etc. When I would arrive home every year I became aware, over the course of the year, that my previous visit was nothing . . . "
Sfas emes tikon la’ad – the lips of truth are established forever. With these words, the holy Sfas Emes left this world, on 5 Shvat 5665. Zechuso yagein aleinu v’al Kol Yisrael - may his merits protect us all! As we are leaving the Rebbe Reb Zusia's yahrzeit, I would like to present a niggun of one of his direct descendants, Rebbe Mordechai DovBer Twerski Shlita, the Hornosteipel Rebbe. Now living in Flatbush, NY, the Rebbe journeyed back to his native Denver last fall, where he spent a Shabbos and had a Melave Malka. Thanks to a young man known as "Feivel Jay 770," we can now view seven clips from this Melave Malka on YouTube. Clip 5 - The Denver March - composed together with his father. Psalm 126 - Shir HaMaalos, to the tune of V'Ha'arev Na. I hope to be posting more interesting clips of Negina in the future. Stay tuned! Today is the 2nd of Shvat, the 208th yahrzeit of the Rebbe Reb Zusia of Anipoli, talmid of the Maggid of Mezritch and the younger brother of the Rebbe Reb Elimelech of Lizhensk, who introduced him to Chassidus. He was a great anav [humble person] and had fervent yiras Shamayim – fear of Heaven. His divrei Torah appear in a small sefer called Menoras Zahav [“The Golden Candelabra”]. Reb Zusia is also the forefather of the Hornsteipel Twerski family, who are direct descendants [ben acher ben] of his. The Rebbe Reb Zusia and his family lived in abject poverty, but the Rebbe was always 'satisfied with his lot.' His wife was never accustomed to luxuries, and due to the dire straits, she managed to live very frugally, wearing the simplest of clothes - most of them old and used. However, she once desired to have a new dress made, and nudged her Rebbe Zusia until he finally was able to buy her the material. When she received it, she brought it to a tailor to have the dress made. It was only a few days later that the Rebbe Reb Zusia saw his wife was again in distress. "Now what happened?" he inquired. "Didn’t you just have a new dress made, so why are you so sad?" "What dress? I have no new dress at all!" was the response. "How can that be? I myself gave you the materials for the dress," asked the Rebbe. "When the tailor had finished making the new dress," she related, "I went to his shop to bring it home. As he was about to hand it over to me, he let out a deep, heartfelt sigh. I then asked him, 'What is the cause of your distress?' "
"He then explained: 'My daughter just became engaged to a fine boy, but due to our financial distress, I don’t have money for a proper dowry, or even for a wedding dress. As I was making your dress, the chasan [groom] saw it, and thought that surely this is for my daughter, his kallah [bride]. When he learned that it was for someone else, he became very angry, and caused me much pain and distress.' "
"Upon hearing the tailor’s woes, I didn’t hesitate, and gave him the dress as a gift for his daughter’s wedding. But now, I am distressed that I only have these tattered clothes to wear." 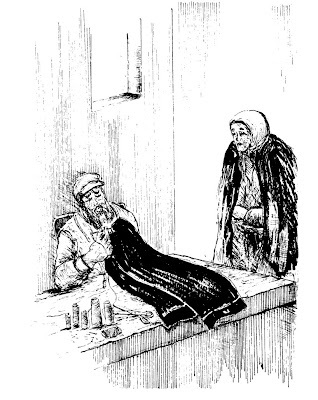 "You did a wonderful mitzva by giving your dress to the tailor’s daughter," said the Rebbe Reb Zusia, "and you have nothing to be distressed about. But did you pay the tailor for his work on the garment?" "What!?" exclaimed his wife. "I gave him the entire garment - why should I have to pay him for the work?" "Well, let’s see," said the tzaddik. "All week long, this poor tailor worked on your garment, in anticipation that by the week's end, he would be able to have some money to feed his wife and children. Now what should this poor man do? Where will he get the money to feed his hungry family? Is he guilty that you gave his daughter the dress as a gift, that he should be deprived of his wages?" Listening to her husband, his wife immediately took out a loan in order to pay the tailor his wages. The tailor received a wedding dress for his daughter, as well as his earnings. And the Rebbe Reb Zusia and his wife? They were delighted to have done the mitzva of Tzedaka to perfection! UPDATES: 1. Two more wonderful Rebbe Zusia stories [one of them in the comments] can be found at our friend, A Simple Jew, here. 2. There's also some lovely material on Rebbe Zusia at R. Tal Zwecker's Beer Mayim Chaim blog, here. Zechuso yagein Aleinu v’al Kol Yisrael – May the Rebbe Reb Zusia's merits protect us all!